11.9" x 11.8" stitched on 14 count. 9.3" x 9.2" stitched on 18 count. 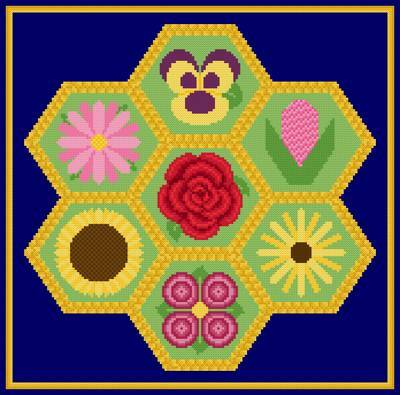 Blooming Posies cross stitch pattern... 7 different flowers grace the seven 6 sided figures. The flower decorated pieces look like they are attached with woven, straw colored braid. Whole stitches. Small amounts some colors used.